Fig. 6. 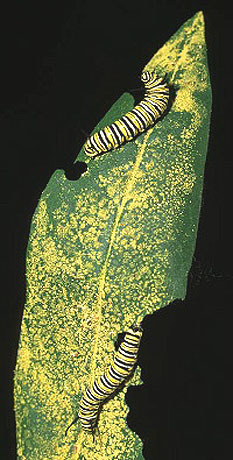 Monarch butterfly caterpillars feed on a milkweed leaf that has been coated with corn pollen. Photo by Kent Loeffler, Department of Plant Pathology, Cornell University. Source: Plant Health Progress - Can Risk Analysis Colorize the Black and White of Transgenic Crops?